Get ready to give a delicious surprise to your sibling on the day of Rakhi with dry fruits gifts. Tie Rakhi on your brother's wrist and send best wishes with dry fruits basket. These baskets are filled to the rim and brimming with joy and happiness. Most of the Indians love to receive dry fruits as gifts on festivities. Dry fruits are no doubt, expensive for gifts but loving and delicious gift item for Raksha Bandhan. You can purchase a box filled with whole almonds, whole Brazil nuts, whole cashews, California roasted and salted pistachios, whole hazelnuts and pecans, cinnamon walnuts, and honey almonds. Your brother would love to gorge on these dry fruits on the day of Rakhi as well as after it is over. Moreover, dry fruits are nutritious for the health of either brother or sister. 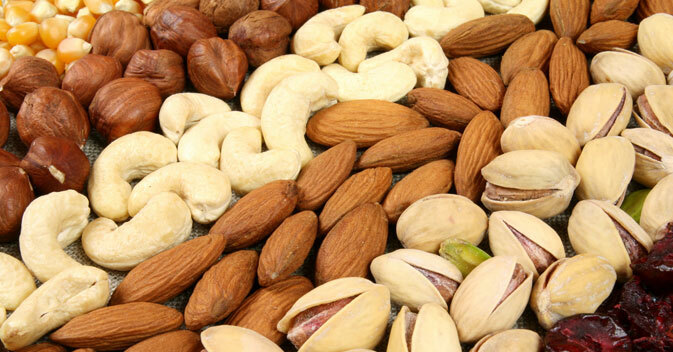 You can even take single dry fruits pack as a Rakhi gift like Almonds pack, Cashews pack, Apricots or dates. Besides, salted pistachios and walnuts would be admired too. Dry fruits are well known all over the world. These can stay without refrigerating for days. Hence, if your brother stays out of India, you can send dry fruit gift basket accompanied with a card and bouquet of flowers saying 'Missing you dear Brother". There are many fruits that are sold as dried fruits. These fruits are pineapples, apricots, pears, prunes, peaches, dates, cherries and figs. These are hygienically sun dried, healthy and beautifully packaged. It makes for toothsome and savory delight for all the festive occasions. Dry fruits like dried apricots are rich in 'carotenes' (the natural yellow pigments) that the body requires to make Vitamin A. Potassium, iron, calcium, silicon, phosphorus, and Vitamin C are also provided by apricots. Blueberries are a great anti-oxidant. Walnuts and raw almonds are good sources of protein. Hence, we know that dry fruits are really blessing in disguise! So, purchase a pack of dry fruits and gift as Rakhi gift to brother or Rakhi gift to sister. sendrakhi.com offers you interesting information on dry fruits. For more information, keep browsing the pages of the website.